On 15 July 1871, the whole tenor of Livingstone’s experiences in Nyangwe changed dramatically. It was a market day, and Livingstone attended as always. He was just leaving when a few Arab traders (the number varies by account) entered the market carrying guns. A moment later, possibly after an altercation with the sellers, the Arabs began to fire on the market goers, most of whom were women. The local inhabitants held the market on a stretch of open land on the right bank of the Lualaba River, near a creek that flowed into the river. This creek offered a convenient place to land canoes. When the firing began, a general panic ensued. Everyone ran for the canoes, but a second group of Arabs near the creek also began to fire on the crowd. Now everyone made for the Lualaba – even those who could not swim – and threw themselves in. The Arabs continued to fire. In the ensuing chaos, many of those who avoided the gunfire got caught in the current and drowned. Figure 1. 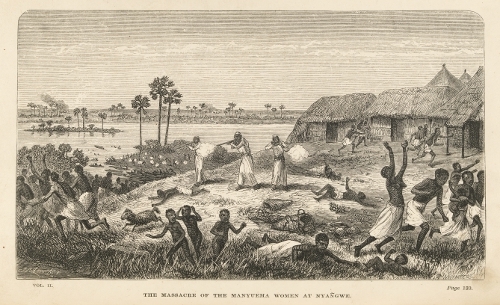 The Massacre of the Manyuema Women at Nyangwe. All told some 300 or 400 individuals died, with others being captured by the Arabs to be made slaves. In addition, the Arabs crossed the river and began attacking and setting fire to many of the villages on the left bank. Livingstone counted 17 villages in flames. The "slaughter" (1872a:692) continued into the next day. The reasons for the attack, which came into focus only gradually, are as follows. A few days earlier Manilla, one of the head African slaves of the Arabs, went over to the left bank and sacked 10 villages of the Mohombo tribe on behalf of a Wagenya chief named Kimburu (Livingstone 1871a:297b/141). The Arabs under Dugumbe resented Manilla’s forward behaviour and attacked the market goers and Kimburu’s people in retaliation. Nearly 70 years ago, Sir Reginald Coupland (1945:77ff.) definitively outlined the factors that prevented Livingstone from continuing his explorations forward from Nyangwe and, therefore, that led to the Livingstone-Stanley meeting. These included illness, resistance from the Banian slaves, and a variety of local factors. However, no single event impacted Livingstone’s plans as profoundly and rapidly as the massacre. In the July 16 entry of the 1871 Field Diary, he writes that "the murderous assault on the market people was Hell without the fire and brimstone […] It filled me with unspeakable horror" (1871a:297b/151). By July 17 he had made his decision to return to Ujiji. On 20 July he departed. of the Congo Free State in 1893 (Hinde 1895:433). 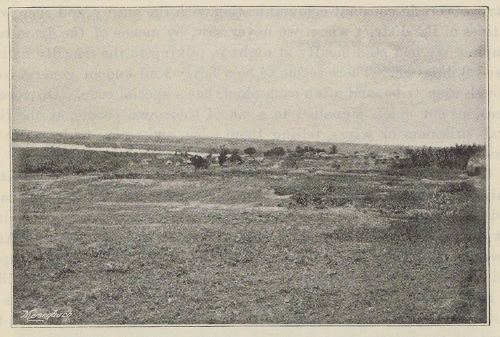 The chief perpetrator of the massacre was one Mtagamoyo (a.k.a. Mwini Mohara), who had never been mentioned in Livingstone’s 1871 diary until this moment. He would become notorious through the published accounts of the massacre, but he escaped punishment. In fact, over the ensuing two decades Tagamoio established himself as one of the leading Arabs at Nyangwe and remained so until brought down by the forces of the Congo Free State in 1893 (Hinde 1895, 1897).